Imagine a city filled with overwhelming stillness, where lone figures wait ambiguously in deserted diners, streets are lifeless and not a word is exchanged. This is no dystopian thriller but rather, how American realist Edward Hopper chose to capture the New York City of the 20th century – images at odds with the bustle and speed of his time, yet perhaps perfectly in tune with its underlying psychological resonance. It’s a similar cityscape that Stephen Shore presented to us in his “Uncommon Places” series three decades later. In his eerily empty cities, light and shadow seem to be the main inhabitants, intensifying the pervading emptiness. It’s thanks to the Whitney Museum of American Art’s current exhibition “Edward Hopper and Photography” that such comparisons can be drawn. Bringing together the works of six photographers, Gregory Crewdson, Philip-Lorca diCorcia, William Eggleston, Steve Fitch, Todd Hido, and Stephen Shore, the exhibition celebrates the far stretching influence of this “Hopperesque” world. Their works are built upon a disconcerting lack of narration, leaving the viewer to find meaning in the dreary commonplace. Like Hopper, their use of light isn’t simply a realistic finish, it’s a narrative code. Crafted with precision, its purpose is to direct our thought and reveal a psychological reality that might otherwise have been missed in the haste of a crowded street. Many see in Hopper’s work the cold alienation and anxiety of modern life in the city. 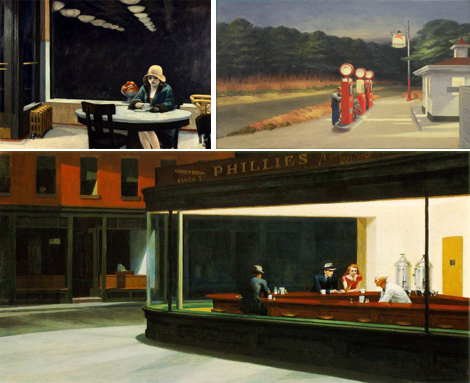 Indeed, paintings such as “Nighthawks” show a united loneliness, no longer paradoxical in an advanced capitalist society. Yet, it is the light itself that seems to draw these people there, as a source of security and assurance that can be found only in the possibility of human presence. Restaurants and petrol stations are brightly lit, surrounded by an all-encompassing darkness. Although the individuals may appear lonely, these havens of light seem a far better alternative than the darkness looming at the door. In the same way, Philip-Lorca diCorcia’s images suggest an incessant human desire to move towards the source of light, as though it possesses some reassuring or perhaps even redemptive quality, if only it could be seized. Steve Fitch too, explores this idea, his fluorescent, neon motel signs calling out into the darkness, signalling the familiarity of human presence in the shadow of the unknown. His images recall those of Jamie Lau, recently commissioned by Open Eye Gallery to document Liverpool’s China Town. His shots of illuminated, fast food joints shine through the darkness, where people gather to eat and then swiftly leave. It hints at the transitory presence of humans throughout the city, flitting through the inhospitable darkness yet unable, or perhaps unwilling, to find any permanency. Yet Hopper also strives to capture something beyond this desolate, communal alienation. His paintings hint at an individual solitude, one that is intentional, even transformative. On viewing such paintings, one can’t help but think of Henry David Thoreau’s lonely retreat to the “woods,” to discover deeper truths through personal introspection away from the distractions of the city. Hopper brings this rural solitude to the urban realm, intruding on lone figures caught in the midst of reflection. Light appears almost as an integral element, penetrating the rooms in striking shapes and blocks, a physical entity with which the subjects must interact. In contrast, the rest of the painting is noticeably without light, the source of this illuminating presence existing just beyond their grasp. This pervading darkness creates a sense of entrapment while the beams of light emerge almost as some sort of release, an illuminated opportunity for transcendence beyond the, perhaps self-inflicted, confinement. 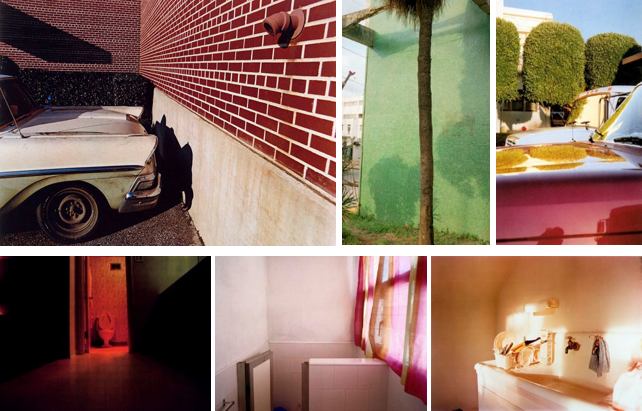 In fact, William Eggleston uses light in such a way as to hint at the existence of some delicate world of beauty floating just beyond the ordinary, if we can just look closely enough. Dousing trees, car bonnets and toilets in dramatic light and shadow, he provokes us to re-evaluate the ordinary miscellanea of our everyday experiences. Gregory Crewdson’s elaborately staged photographs invite us into a world in which the sensibility that Eggleston applauds seems to be missing. Ordinary scenes of American suburbia appear dark and ominous and the only source of light, a murky, artificial haze, offers no appealing respite. The stark glow of a refrigerator is the only aid to a moment of reflection, the hypnotic blue glare of the television pulls people in, leaving behind skeletal white bodies and emotionless, unthinking faces.